One of the programs I accompany is a girl's (pre-teen/teen) program in the south of Bogota, in a barrio called Caracoli. The program is new this year, 'Proyectándome a un futuro'; there isn't a good translation of the name into English, but more or less it's projecting/giving myself a future. The idea behind the program is to help the young woman of this very impoverished community (one of the most impoverished in Bogota) see the options for their future. During July, many of the schools have a short break (the schools in Colombia operate on the calendar year with a few shorter breaks throughout the year). One of the goals of 'Proyectándome a un futuro' is to give the young women (ages 11-16) some job skills, so they can have enough money to stay in school and buy notebooks, uniforms, and help out their families, as well as understand a little more about business and money management. 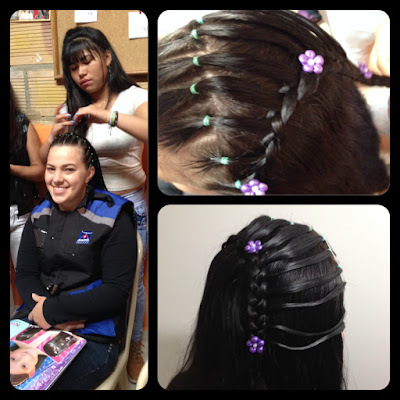 During this break 'Proyectándome a un futuro' brought in a woman to teach the girls some hairstyles. This was a 6 day class, spread over two weeks. The girls that completed the whole course got a certificate. Every day for the class the girls needed to bring their 'model', a younger girl who they could practice and learn on (bonus for their models was a new - free hairstyle everyday). I was a 'model' on Saturday for Tatiana. As you can can see from the collage below, these are very intricate hairstyles. Each girl was given their hair-styling kit, which included a book of all the different hairstyles they learned. Saturday their task was to let their model go through the book and pick whatever hairstyle they wanted. Tatiana, seemingly effortlessly did this style to my hair (I asked her to pick the style she thought would look the best, and be the best for an adult). This last Saturday was the last day of class, the room was full for the award ceremony and cake that followed. During the ceremony one of the girls shared her story that already (before she had even finished the class) a neighbor girl came to her to have her hair done. A hairstyle like these cost about 5,000 Colombian Pesos (or $2.50). This may not seem like much, however this is considerable (especially when you consider the age of these girls) and that this money will definitely help out her family. Her story (I hope) will also inspire the other girls and definitely affirmed the skills they were being certified for. Hairstyles like these are popular, and with the certificates, these girls will have the opportunity to work and earn a little money. We also used this class as an outreach tool for the community. We opened the class up to the girls in the community who are not yet a part of 'Proyectándome a un futuro'. There was a huge response, and many of the girls promised to come back and become an active part of the program. I am excited for the weeks to come to see how the 'Proyectándome a un futuro' grows, and how these girls continue to use their new skills. P.S. Please consider subscribing to our blog (upper left corner). Once you subscribe, don't forget to respond to the confirmation email. Thanks for reading!